The early 1500s were the times of the "Italian Wars," a series of conflicts between 1494 and 1559 that involved almost all powers in Europe, from small city-states to large nations to the Pope. It is a time of such agonizing complexity and detail that even rock-solid history wonks simply keel over and die in class. Just think: there were seven or eight individual wars specified by date or name (i.e. the Italian War of 1494-98 or the Italian War of 1542-46 or the Italian War of the League of Cambrai), dozens of campaigns and scores of individual land and naval battles as well as sieges of major cities. If you could code it the way you do with chess moves, you might write: IW21-26/Ses24/Sp>Fr to show that in the Italian War of 1521-26 the Battle of Sesia took place in 1524 and Spain beat France. It may be helpful to recall what is known in physics as the three-body problem —determining the possible motions of three bodies (say, the sun, earth and moon) which influence each other through gravitation. Perturbations in gravity make the solutions very difficult— or even "arbitrarily complex," as one book I consulted put it. That describes the "Italian wars" very well —arbitrarily complex. Essentially, translated into geopolitics the three bodies in question in the early 1500s are France, Spain, and the Pope. Imagine Europe as the surface of a billiard table. You roll billiard ball number one, call it France, onto the table. Keep it rolling so that it caroms off the cushions like crazy. You then roll number two onto the table —the Pope (in the form of the powerful entity known as the Papal States (much of north-central Italy). Same thing —keep it rolling. Then you roll number three, Spain, but by the early 1500s, it's not just Spain, since the Spanish king has just (1519) been elected Holy Roman Emperor, Charles V, and he is a Hapsburg; that is, he is of the dynasty that rules the large Austrian holdings in Europe. Spain is really Spain+Holy Roman Empire+Austria and, thus, more the size of a bowling ball on the billiard table. (There are some extraneous marbles on the table, as well: England, the Protestant Reformation, Ottoman incursions in the Mediterranean, etc.) Keep them all going. Now, try to figure where each one is going. They will hit each other a lot. Those collisions are the wars. France and Spain had evolved into nation states along rather natural lines, but Italy had not been as fortunate. First of all, there was no single Italy; there were northern city-states or duchies and, in the south, a solid ex-kingdom of Naples, now a Spanish vice-realm, part of the Holy Roman Empire. France tried to even up things a bit with said Empire by invading the Duchy of Milan in northern Italy and by enlisting the support of the Pope. The two powers, France and Spain (Empire), thus chose the fragmented north of the Italian peninsula for the main battles, but they also had their eyes on the south, Naples, which they both had been fighting over for centuries. Each side hoped to get the Pope on its side; sometimes it worked and sometimes it didn't. Allegiances changed rapidly over the course of the first three decades of the 1500s. The League of Cognac was an alliance formed in 1526 by Pope Clement V with France, the Republic of Venice, the Duchy of Milan, and the Republic of Florence. The goal was to combat the bowling ball. The wars had been going well for the Empire (the emperor, Charles V, still held his vice-realm of Naples). The wars had not been going well for the French; thus, with the strength of the new league and no doubt a good amount of cognac under their belts, the French decided to aim straight at the heart of the southern part of the empire—Naples. Capture the capital! The invasion came by land, under Lautrec (Odet de Foix, Viscount of Lautrec) and by sea in the form of the Genoese fleet commanded by Filippino Doria, nephew of the famed Andrea Doria (whom the Cambridge Encyclopedia of the Reformation refers to as "the great Genoese sea-captain, who was in himself almost a European Power..."). With Lautrec's army besieging the city and Doria's fleet blockading the bay in the summer of 1528, it seemed like a done deal—the French would get back the Naples they had lost to the pre-Spain Aragonese in the previous century, the power of the Papacy would increase and that of the Empire decrease. Then, the French king, Francis, did something stupid: he offended Andrea Doria with a plan that would have diminished the importance of Doria's Genoa. Doria protested and the king tried to have him arrested in his own city. The emperor stepped in and offered Doria a deal to save him and bolster Genoa if Doria would change sides, which Doria did. He ordered his fleet to lift the blockade and supplies flowed into Naples again. A plague epidemic then broke out among Lautrec's besieging army and Lautrec, himself, caught it and died. The French packed it in and withdrew from Naples. After a few more campaigns in the north, the Italian Wars petered out, but not without some rather bizarre episodes. This includes IW42-46/SgoNc43/HRE>Fr+Ott (I am not giving up on this! ); that is, during the Italian War of 1542-46, there was a siege of the city of Nice in which the forces of the Holy Roman Empire defeated a combined French and Ottoman force. (That's right, the French asked for naval help from a Muslim power!) France finally gave up on taking over the Italian peninsula. The result of all of this is that Imperial power increased greatly in Europe at the expense of the French, the Papal States, and especially the small city-states of northern Italy such as Genoa and Venice. And in Naples, after the siege, the Spanish finally sent in a strong viceroy, Don Pedro de Toledo. He spent the next few decades rebuilding the kingdom and the city of Naples, making it the most strongly fortified city in the world-wide Spanish Empire. *About the illustrator: Albert Robida (1848-1926) was a French illustrator and novelist. 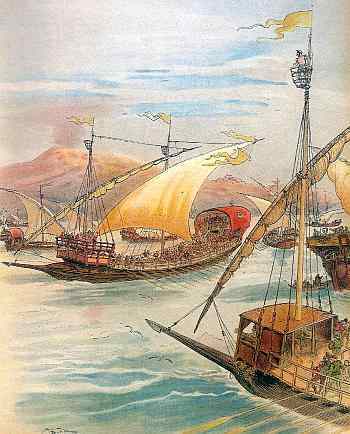 He drew countless illustrations for historical and literary works; this particular one shows the Genoese fleet in the Bay of Naples (with Vesuvius in the background) during the Siege of Naples. Robida also illustrated his own popular futuristic novels. He was compared to Jules Verne at the time but has since slipped into obscurity. A little naval history: I was unsure of the illustration, which I found labelled "Siege of Naples" in an old magazine. The ships are lateen-rigged galleys (that is, with triangular sails), which looked very out of place and time to me. I was wrong. Such ships were the mainstay battle ships in the fleets of the medieval Italian maritime republics (Pisa, Genoa, Venice, Amalfi) until 1600. The fleets of both Christian and Ottoman fleets at the famous Battle of Lepanto (1571) were largely made up of such ships.